I've posted plenty of stories about solar thermal power in the Sahara, a scheme long ago dubbed deserts of gold, with most of them talking about large scale CSP plants in North Africa supplying clean energy to Europe. 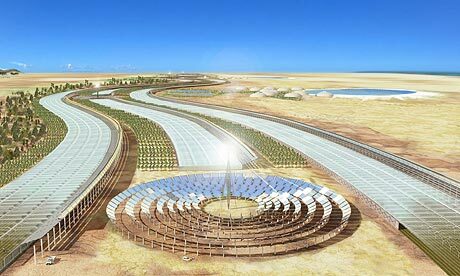 The Guardian has a new twist on this vision, with desert CSP plants being twinned with "seawater greenhouses" that grow crops using desalinated water produced using waste heat from the power plant - Environment: Solar plant yields water and crops from the desert. MG - yes - if we actually succeeded in "ggreening" whole desert there would undoubtedly be unintended consequences. However - it (and other deserts in the middle east and elsewhere) are vast, so I struggle to imagine these sorts of facilities would ever cover anything more than small percentage of the available land. As they rely on seawater, they need to be fairly close to the coast for starters. Comparing the two articles on Africa... this one and the microbial fuel cells... I think the MFC is much more likely to succeed. This one seems more of a "World Bank" style mega project more for the benefit of non Africans. The MFC project uses simple easily disseminated technology with an immediate benefit to the people - recharging mobile phones thus maintaining communications. Although many people seem to think that the "third world" will suffer most from oil depletion (maybe), I sometimes wonder if these nations will be the first to adopt usable "low tech" appropriately scaled technologies while "the West" turns up its collective nose because that won't power the plasma TV! Thus driving the "myth" that "our society" can only run on prodigious amounts of power (read nuclear). "I've posted plenty of stories about solar thermal power in the Sahara, a scheme long ago dubbed deserts of gold, with most of them talking about large scale CSP plants in North Africa supplying clean energy to Europe." Don't the North Africans need clean energy? Or if they don't use much electricity now, surely after years of producing heaps they'll start using it? No doubt CSP is a good alternative to traditional fossil fuel powered electricity generation, and growing food in a greenhouse is better than importing it from afar. What would encourage me more, however, is a realisation that these kinds of projects will not make places like Dubai sustainable. If we are not willing to make many small sacrifices that lead us to a simpler way of life then one thing or another will become scarce, overdrawn or over-polluted. It seems that doing those steps first would be prudent. We could then use the resources saved to build an appropriate amount of renewable capacity. Unfortunately the progress myth makes us believe we do not have to give up anything or change our ways. great effort indeed......the whole idea is favouring humnaity. SP - my long held view is that it isn't an either/or choice - both solutions are good - its a question of what is appropriate - economically, environmentally, culturally etc - in each location. 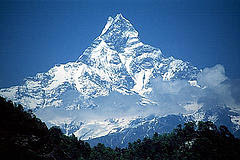 MFCs are great in undeveloped, off-grid villages and remote areas. CSP plants (and other facilities hanging off them) are great in deserts. Its not a matter of choosing one or the other. kiashu - I'm not implying that the electricity gets sent offshore to Europe exclusively - with power generation the basic premise is that it is available on the local grid as a starting point, and the surplus is exported through one or more interconnectors. Taking the ELM model into account is an interesting idea, but its worth referring to that map of north africa in my solar thermal post which shows how much area is required to satisfy global energy demand. Given that there is far more energy available than we will ever need, and that it is completely renewable and appears again every day, it isn't really appropriate to apply a peak / depletion model and an ELM overlay. Tim - can you explain why you think these sorts of facilities couldn't make cities in the deserts sustainable ? Granted Dubai's current level of excess isn't sustainable, but why couldn't the city be transformed to one that relies on power and fresh water generated by the sun ? Even more so for places like Masdar that are designed to be sustainable in the first place. This is a classic of mixed statistics. The article mentions that 20 hectares will cost 80 million euros and that if we had 1% of available desert we'd have 20% of the worlds energy covered. 1% of the worlds desert is the equivalent of 49 million hectares. So if 20 hecatares cost 80M euros then 49 million hectares will cost 196 TRILLION Euros. All of these ideas are great but people need to be able to write credible business cases to get people to invest. Using spurious figures like "only 1% of the earths deserts" is not helpful. Sorry, made a mistake, it's 64 Trillion Euros to cover 1% of the earths deserts. Why is it that any good ,long term green project is always torn apart as unrealistic and grossly overpriced.The nuclear industry,always grossly over budget,never very efficient,extremely dangerous,highly polluting and a very limited resource, there is not that much Uranium on Earth,is hardly a good sustainable sustitute. mark spencer. An important consideration about costs of such projects as csp, are that once started the costs of expansion come from the profits of the earlier set up, it's called reinvestment. C.S.P. is also very efficient at providing the energy required to smelt metals and glass from ores and so dramatically cut it's own costs and pollutants.Could you imagine how far the oil industry would have got if someone suggested setting up thousands of oil rigs all over the world and how much all that super structure would cost. (ignoring the profits for reinvestment !) The nuclear industry was set up wiyhout even knowing if it could be safely decommissioned, let alone how much it would cost! You certainly won't see me suggesting the nuclear industry is a cheap or viable alternative. A lot of green megaprojects are expensive - but so is pretty much every other megaproject. This project could be a great way to create jobs and investment in the depression economy we're in. The European union, private investors, and possibly Obama could put up the billions of dollars needed. On that scale, enough jobs, electricity, and food would be created to turn around this economic downturn. On another note I have noticed that green technology doesn't replace black (coal, oil) or orange (nuclear) energy. It just adds the amount of energy available. Green energy will only replace other forms when they either run out, cost too much, or get shut down by the government.